I am part of the new Baking group for Healthy Bread in Five Minutes a Day . Our first recipe was a secret recipe, given to just the baking group! It is also listed in the book, as Pumpkin Brioche, made with partial white whole wheat flour. I swear I read Recipes. I dumped everything in the bowl (since this book uses Vital Wheat Gluten , you have to mix the dry ingredients first so it does not lump up. Then put in the wet ingredients. I, for whatever reason, did not see the water in the recipe! I mixed it up, and it was really really dry. I thought I had done something wrong, but looking at the recipe I still did not see any water. The dough did not rise. Then, I found the water in the recipe! And it rose beautifully. I doubled the spices in the recipe since a few people said that they did not come through in the dough. To make the monkey bread, I used small pieces of the pumpkin brioche, rolled them in a mixture of cinnamon and sugar, and put into a large bundt pan. I was in a rush, so they only rose for about 45 minutes. The last time I attempted monkey bread (with the Brioche recipe from the first book), I let it rise overnight in the fridge, and it rose quite a bit higher. Of course, what would this blog be (at least the idea of this blog) without a fail. I burned the mini loaves. And they were baked in silicone! So did you bake the Brioche from the first picture? What a good idea to make this into monkey bread! I bet with some added cinnamon and brown sugar, that was fantastic. I do crazy things like leave critical ingredients out of recipes all the time. It happens to the best of us! 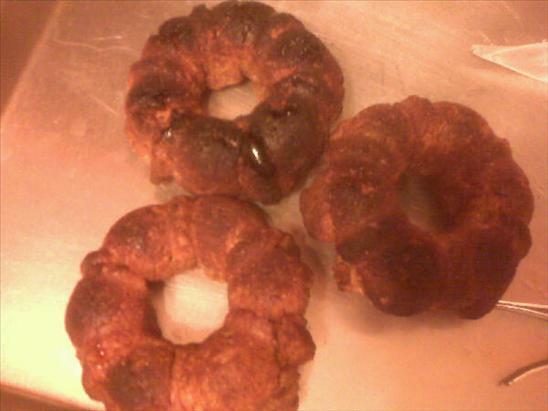 OH Amanda your Monkey Bread looks so good! I just love the way how the drizzling looks on it. I love making Monkey Bread, it’s just so much fun! Just love the creativity running around loose in this group! The monkey bread was a great idea! It’s probably much more flavorful with this dough. Glad you were able to figure out what was missing. I do things like that all the time!! Thanks for another great idea. Monkey Bread! Monkey bread was a very clever idea. It looks delicious! 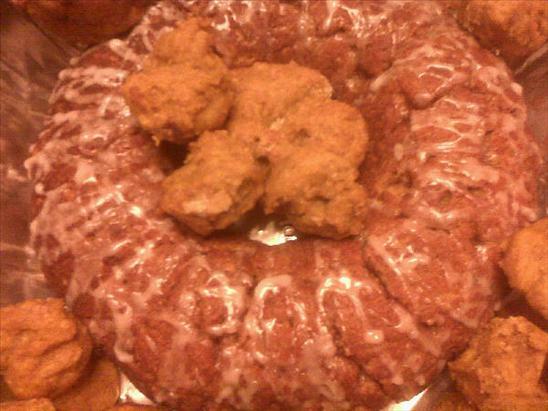 Monkey Bread?!? Who could refuse that! Love it!